Our Gift Box contains one dozen cookies. 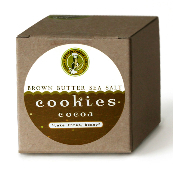 The Cocoa Brown Butter Sea Salt cookies are made with all natural Scharffen Berger cocoa powder giving them a soft velvety texture. We love to pair our Cocoa cookies with a bold glass of red wine or glass of milk. Enjoy!